Lock in a great price for Villa Pescadores by Ahau Collection – rated 8.6 by recent guests! Nice location close the ruins and a bit removed from some of the hustle and bustle. Awesome food, great service, and the accommodation were amazing. The location of Villa Pescadores is great! 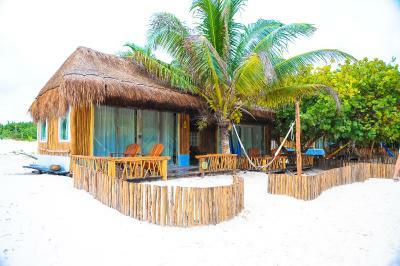 A short bike ride or walk to the Tulum Ruins and a short drive from both the town of Tulum, and the other Hotel District. We liked that our beach area was not quite as developed as the other hotel area, it felt quieter and more intimate. Food was incredible. 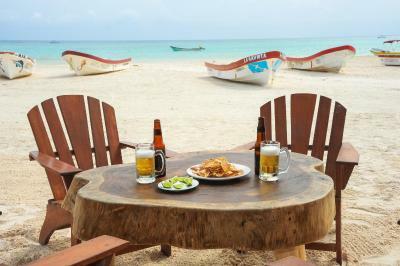 Fresh fish and plenty of beer, margs and pina coladas! Staff was all very friendly and we had great service at the restaurant. Staff were so nice. The day beds on the beach were awesome, definitely the best on the beach that I saw. I room was great and was easy to catch a cab to go to other main part of town. 100% recommend! The room, bed, and facilities were great. We had a garden view room #4 and it was perfect. Direct access to the sea. Wonderful garden with great evening lightning. Morning coffee to the beach bungalow. The location is terrific, right on the beach. 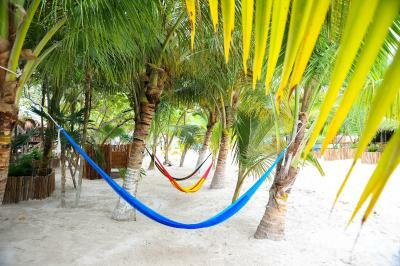 The resort is well taken care of with hammocks throughout the property. The staff is friendly and there are always taxicabs waiting right outside of the hotel. 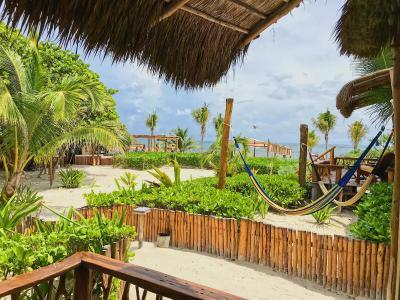 There is a restaurant on site and it is within walking distance to other beach clubs, the Tulum ruins and a market with shops and restaurants. You can also rent bicycles on the property to ride around the area. The only drawback is that some of the roads are very narrow with limited or no sidewalks so being careful is a must. The food at the property restaurant was AMAZING! Every single staff member went above and beyond to accommodate our stay with genuine smiles and hospitality! We’ve never had such an amazing experience at any other hotel. Great Location. Close to quiet area on beach. 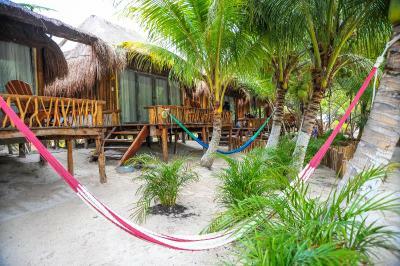 The front porches of the rooms are beautiful with great hammocks. The restaurant is really great too. Manolo & Miseal were on point and took care of us on the beach all day day never had such a great experienced runner service! Villa Pescadores by Ahau Collection This rating is a reflection of how the property compares to the industry standard when it comes to price, facilities and services available. It's based on a self-evaluation by the property. Use this rating to help choose your stay! Offering a restaurant and a private beach area, Villa Pescadores is located 5 minutes' walk from Tulum Archaeological Site and 3.4 mi from Tulum main square. Free WiFi access is available throughout. 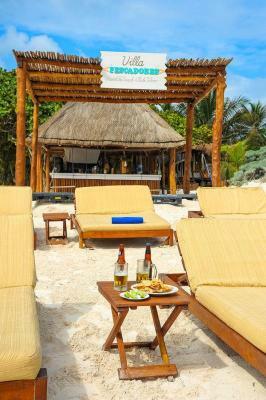 At Villa Pescadores you will find a bar. Other facilities offered at the property include water sports facilities, a tour desk and luggage storage. An array of activities can be enjoyed on site or in the surroundings, including fishing, diving and windsurfing. The property offers free parking. 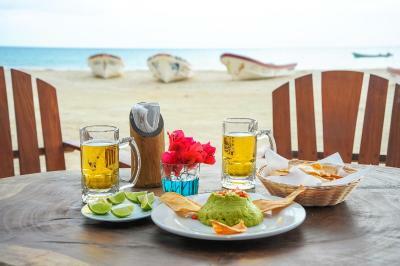 The hotel is 3.7 mi from Tulum Bus station and about 90 minutes’ drive from Cancún International Airport. When would you like to stay at Villa Pescadores by Ahau Collection? This room features a private entrance and seating area. Please note, air conditioning is only available from 18:00-07:00 (overnight). This room has a seating area and private entrance. This room features a seating area and bathrobe. This room features a bathrobe and sofa. This room features a sea view and seating area. Villa Pescadores has a lot of history, starting with the name, which translates to Fishermen Villa. The area where it is located belongs to the cooperative society of fishermen of Tulum. These fishermen built the huts in 2002, in order to have a place to stay and relax on these beautiful beaches. In 2014 an agreement was signed to work and renovate the Hotel taking into consideration the experience and success we have with our sister property, Hotel Ahau Tulum. 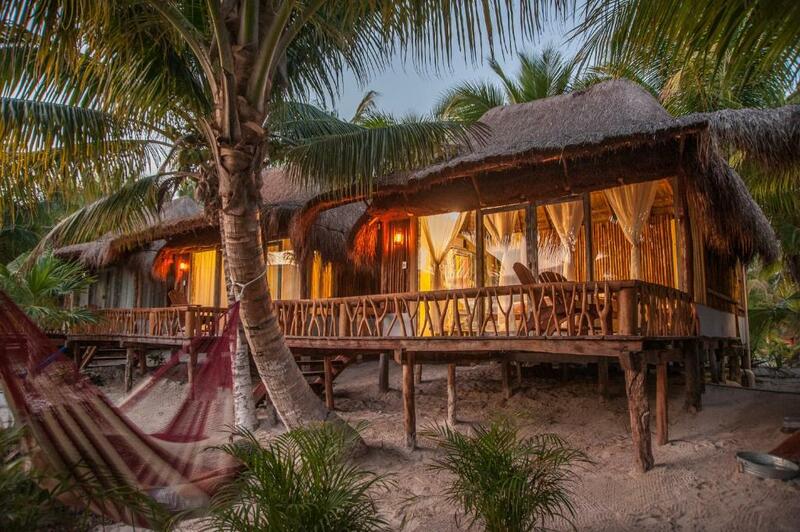 Thanks to the latter Villa Pescadores now ranks in the top Hotels of the authentic Tulum area. 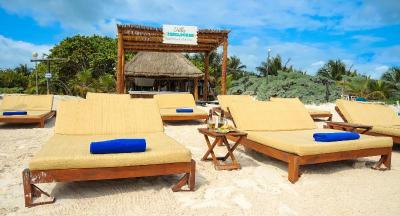 The largest beach of Tulum and the Mayan ruins located on the side frame our Beach Club. With the help of the fishermen we serve the freshest seafood with a seasoning you will never forget! House Rules Villa Pescadores by Ahau Collection takes special requests – add in the next step! Villa Pescadores by Ahau Collection accepts these cards and reserves the right to temporarily hold an amount prior to arrival. Please note the maximum number of extra beds available is 1. Any kind of request regarding extra bed has to be approved by the property. Wifi and cell service. Usually a bonus, but made things tricky when we had to change our flight back. Pretty windy in February; tough when the sand is so fine. Best beach in Tulum and fantastic location. The service on the beach was not as great as the service in the restaurant. There are very comfortable beach beds for guests staying at the hotel (which were amazing,) but the servers did not come over very often and it was often difficult to flag them down. Only feedback would be to give a bit better service to guests of the hotel who go to the beach to enjoy the service. Food and drinks were both amazing so no complaints with that part of the experience! The bungalows in the middle of the jungle provide a total sense of privacy and exclusivity. This truly is paradise. The rooms are beautifully decorated and the staff is wonderful. Couldn’t recommend this place more. The equipment was simple. A little irritating was that the sliding door to the toilet does not wanted to stay fixed close, but moved open all the time, instead you fixed it with your hand. It’s an awesome place on the beach. It’s so peaceful, you can easily relax. The beach club is very comfy, with nice food and drinks and good service. The restaurant food is of course amazing, too. So you do not have to leave the place for eating somewhere outside. It is hard to fault this place, the atmosphere is very relaxed and things happen at their own pace so perhaps for some people that might be seen as a bit of a negative point but after a busy trip this was just what we wanted. The resort is located at the far end of the Tulum beach strip so if you have reservations further down it can be a bit of a walk / cycle to get there but otherwise this is one of the best places we have ever stayed. Where to start with this one... the location is excellent as you are literally a stones throw from the beach and private sun beds exclusively for hotel guest; the "rooms" are exclusive beach huts that have hammocks and partial sea views; just down the road you have the ancient Mayan ruins of Tulum that are a must see; upon the beach you are in easy walking distance of some of the beach bars /restaurants in Tulum; staff at the resort are really pleasant and helpful; views are stunning and the snorkelling (despite having to be taken out to the reef by boat at a cost) is some of the best for seeing sea turtles, sting rays and tropical fish. Cool beach hut seconds from the beach! Hammocks to chill in! Very good food, cute bedroom. Marvellous place directly at the beach. The personal was most kindly and paid much attention on details.